Position or remove Javelin Series 2, Javelin, Javelin Xtra, Practik or Max cutters in seconds without using a single tool. Lift & hold levers allow a single operator to feed, align and cut materials with ease. 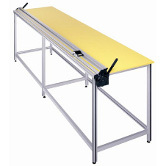 Adjustable feet allow the Big Bench to stand on uneven floors without compromising accuracy. Aluminum base-plate with metric parallel indents and cut groove. Full length Metric & Imperial scale. Full-length grip strip for clamping. Unique leg to beam fixing brackets apply incredible strength to the Big Bench. The unique system allows for a wide variety of customisation options on any Big Bench. Base-plate leveling brackets make it possible to fine adjust leveling and gain optimum accuracy. 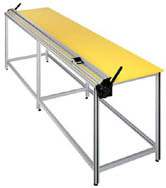 Surface Mount Lift & Hold turns your existing work surface into a precision cutting station.